Within a short time, you should receive an invitation email from one of the site admins. We try to get to them as quickly as we can, but sometimes life gets in the way, so we appreciate your patience! 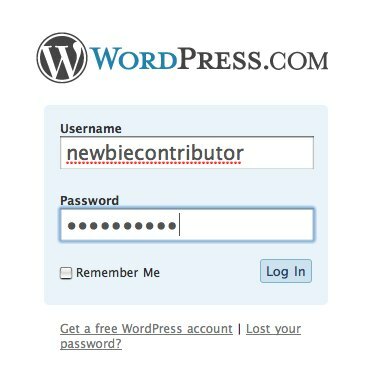 Following the link in the email, you’ll get to the WordPress signup page. Make sure the email address you enter here is the same one that the invitation email was sent to, or you will have trouble posting to the blog later on. 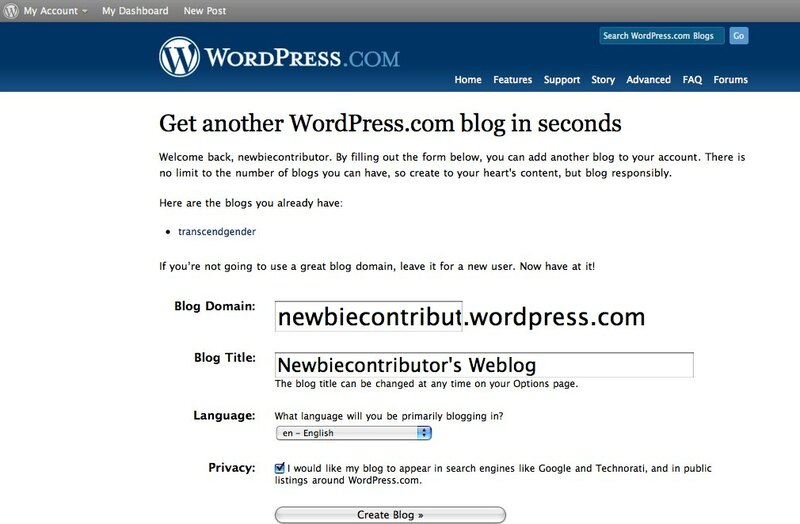 If you want a personal WordPress blog of your own as well, you can choose to create it now – or you can just request a username at this time. Once you select the ‘Next’ button, you should be told to go and check for your activation email message. With any luck, you should soon receive your activation email. 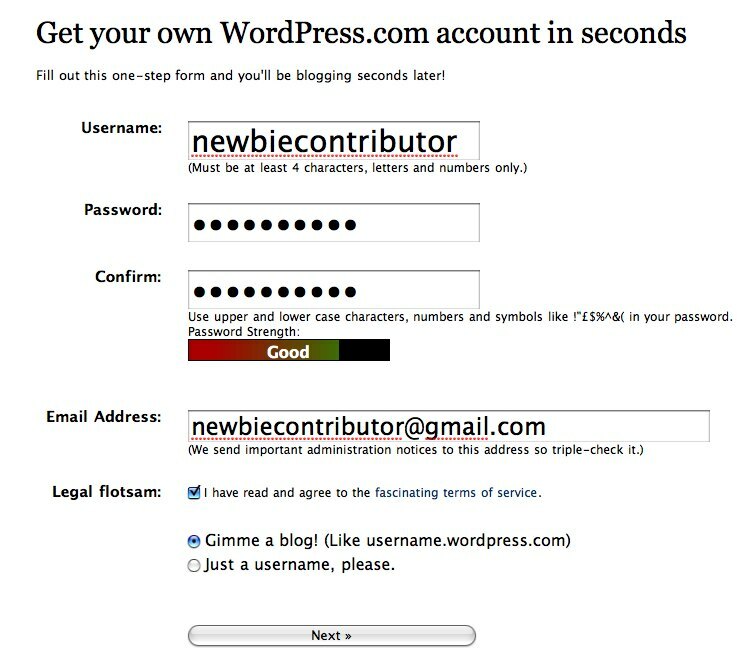 Following the link in that email will activate your WordPress account and you can now log in! 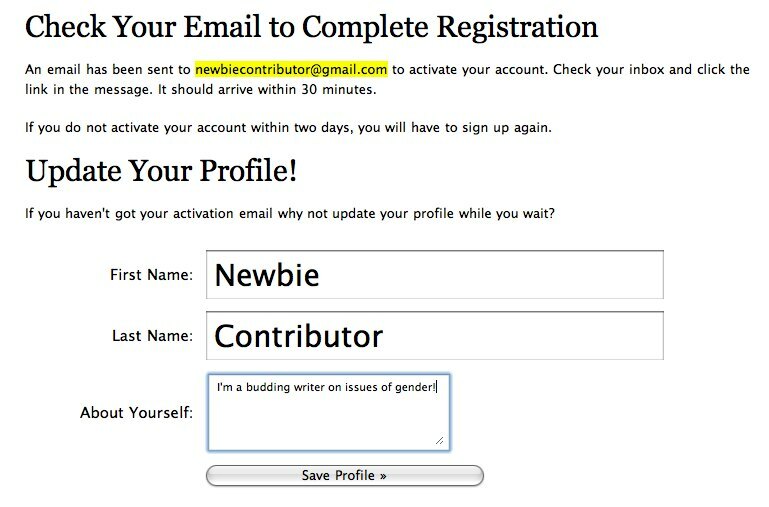 After you log in, you should see that transcendgender is listed as a blog that you already have. If not, let us know! You also get another chance to create your own personal blog at this point, but you probably want to go ahead and select ‘My Dashboard’ from the top navigation bar instead. 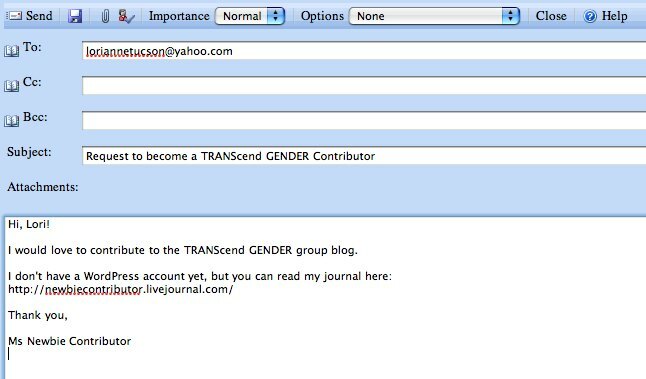 That will get you to the TRANScend GENDER dashboard from where you can make posts. You might be tempted to go ahead and write a new post right away! However, it’s a good idea to make sure your profile information is fully filled out first, so that your post will show up as being authored by the name that you want to be known as. Selecting the ‘Profile’ link on the top right of the dashboard allows you to fill out several important settings. 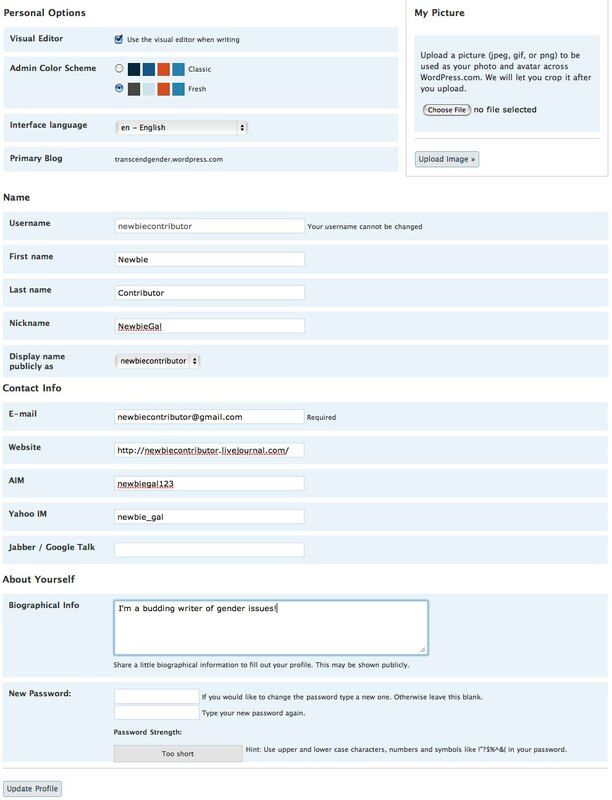 You can upload a picture to be shown next to your name when you comment or post, and the email address and website you put under ‘Contact Info’ will be used whenever you comment on any other blog hosted by WordPress. Make sure to also fill out the first and last name, and nickname options, as you can use them to identify yourself. Once you have set your profile information, you can go back and select the name you want to show up when you post or comment. You’ll see a dropdown list with all the possible variations to choose for your public name. You’re finally ready to write your first post! Choose ‘Write’ from the top menu and let your creative side take over. 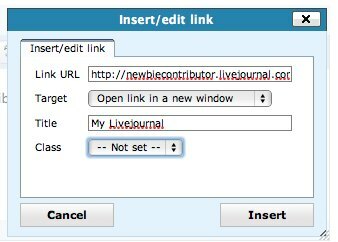 In the screenshots below, you can see how to add a link to another web page by highlighting the text that you want to turn into a link, selecting the ‘Insert/edit Link’ button, and filling in the details in the box that pops up. You should pick at least one category for your post, and also add as many tags as you feel are relevant. This increases the chances of your post being found by searches. When you select the ‘Add’ button next to the tags box, the tags you have entered will be listed below the box, leaving it open for you to add more. To remove a tag you’ve already added, select the ‘x’ in the circle before the tag. Make sure to save your post as you go, including after adding tags and categories, and before using the ‘Preview this Page’ button. You don’t have to finish your post all in one sitting! WordPress will keep it in Draft mode until you’re satisfied with it. To go back and edit your post later, select ‘Manage’ and then ‘Drafts’ from the dashboard. You’ll see your post listed there, and you can select its title to return to the editing screen. 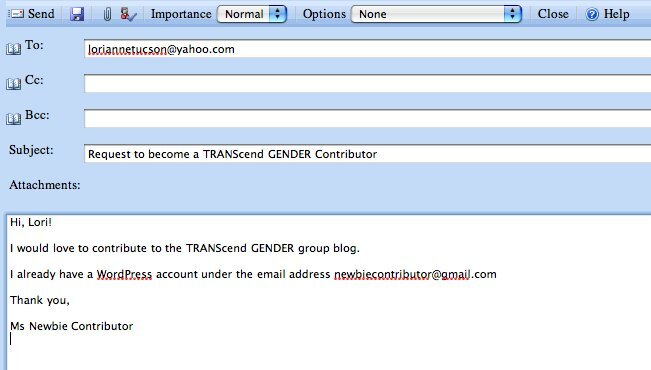 If you find any errors in this guide, please email us at help (at) transcendgender (dot) com and we’ll get it fixed! Sorry, this girl is not the sharpest blade in the knife block, but how do I log on??? I’ve just changed my computer and I cannot remember what to do!! Why isn’t there a log on button to help those of us who can’t see the obvious even when it is in front of our faces!! I’ve added a login link at the bottom of the left hand column, Davinia. Also, you can always to go http://www.wordpress.com/ and log in there (there’s a link ‘Blog at WordPress.com’ at the bottom of every page too that will take you there).